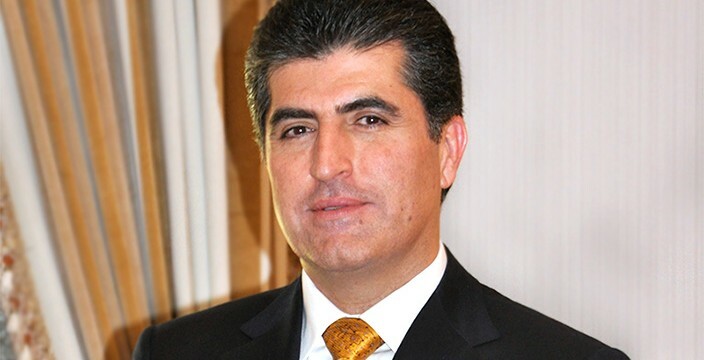 Erbil, Kurdistan Region, Iraq (cabinet.gov.krd) – In a statement Kurdistan Regional Government Prime Minister Nechirvan Barzani, strongly condemned the terrorist attack against Egyptian Copts and extended condolences to the victims’ families and the Egyptian people and government. I strongly condemn the barbaric terrorist attack against two buses in Egypt’s Minya province, killing 30 Coptic christians and injuring several others, while they were on their way to the church. We extend our condolences to the families of the victims, and the people and government of Egypt, while wishing prompt recovery for the wounded victims. At the time when terrorist operations have become recurrent in the world, the international community must confront terrorist groups with further firmness and fight their dark ideology more broadly. 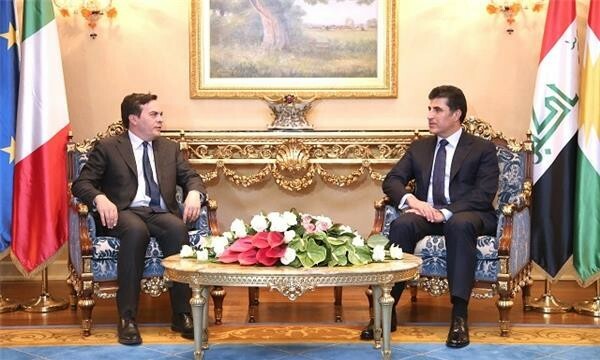 Kurdistan Regional Government Prime Minister, Nechirvan Barzani, received Mr. Vincenzo Amendola, Italian Deputy Minister of Foreign Affairs and his accompanying delegation. In the meeting, also attended by Deputy Prime Minister Qubad Talabani, Mr. Amendola commended the victories marked by Kurdistan Region military forces, the Peshmerga, in the fight against the Islamic State terrorist group, ISIS. He also praised the Kurdistan Region for having accommodated and offered assistance to a large number of internally displaced people, who fled ISIS repression. Mr. Amendola also highlited the cooperation between the Peshmanrga and Italian forces that are stationed in Mosul dam, providing security and protection to the Italian companies in charge of reparing the dam. While reaffiming his country’s will to continue its support to the Kurdistan Region, Mr. Amendola expressed his government’s desire to further strengtrhen bilateral relations. Prime Minister Barzani expressed his appreciation for the continuous support of Italy, recalling Prime Minister Matteo Renzi’s visit to the Kurdistan Region at the beginning of the fight against ISIS in August 2014, which had tremendous moral support for Kurdistan. Regarding relations between Baghdad and Erbil, Prime Minister Barzani highlighted the military cooperation between the two sides in the fight against ISIS. He noted, however, cooperation in other fields is almost non-existent, for which he stressed the need for serious talks between the two sides to settle the diffrerences. Erbil, Kurdistan Region, Iraq (cabinet.gov.krd) – In a statement, Kurdistan Region Prime Minister Nechirvan Barzani strongly condemned Monday’s terrorist attack at a concert in Manchester. I strongly condemn the terror attack that took place at a concert in Manchester on Monday, which killed and wounded a number of civilians. I offer my condolences to the families of the victims, the people and the government of the United Kingdom; I stand in solidarity with them. I wish a speedy recovery for the wounded victims. The continued terrorist attacks in various places across the world require stronger counter-terrorism measures, greater cooperation and coordination of the international community in order to defeat and eradicate terror and its ideology. I hope that the United Kingdom and the world will not experience another terroris act. I extend my sincere condolences to Mr. Nawshirwan Mustafa’s family, friends and the Gorran (Change) Movement. I share your pain and grief. May the almighty rest his soul in peace. It is my hope to see the Gorran Movement and supporters of Mr. Nawshirwan Mustafa continue to serve Kurdistan and our people’s common interests. Erbil, Kurdistan Region, Iraq (cabinet.gov.krd) Prime Minister Nechirvan Barzani received the US Special Presidential Envoy for the Global Coalition to Counter ISIL, Brett McGurk, and his accompanying delegation, including the US Ambassador to Iraq and the US Consul General in Erbil. The delegation commended the Kurdistan Regional Government and the achievements of the Peshmerga in countering the Islamic State terrorist group, ISIS, and for coordination between the Peshmerga and Iraqi security forces in the military operation to liberate Mosul. Mr. McGurk praised the people and the Government of the Kurdistan Region in accomodating and assisting a large number of displaced people. He emphasized his country will continue its military and humanitarian support to the Kurdistan Region. Regarding the political situation in the Kurdistan Region, the visiting delegation expressed support for any step that would lead to stability, and the continuation of dialogue between the political parties. Prime Minister Barzani expressed appreciation for the support of the US in assisting to resolve the outstanding issues between Erbil and Baghdad. He also expressed the desire to further relations between Erbil and Washington. Prime Minister Barzani said that the Kurdistan Region has sheltered a large number of IDPs fleeing terrorism, and that about 35,000 casualties from the military operation to liberate Mosul have been treated in the Kurdistan Region. However, he said, support from Baghdad has been markedly inadequate. On the internal political situation, Prime Minister Barzani stressed that serious talks are underway among the Kurdistan Region’s political parties to resolve internal issues. On behalf of the people and Government of the Kurdistan Region, I extend my congratulations to the new President of France, Emmanuel Macron, on the occasion of his election and inauguration. His victory represents high expectation and hope for millions of people across France and further consolidation of the foundation of the European Union. President Macron’s election also represents optimism for promoting international peace and stability. As President Macron placed the eradication of terrorism among his top priorities, the Kurdistan Region, being at the forefront in this war, looks forward to further strengthen its political and military cooperation with France, in order to achieve peace and stability in a volatile Middle East. Recalling the historical relations between our two peoples, where France generously offered assistance to relieve the extreme distress of the people of Kurdistan during the last century, we hope to further develop our bilateral relations under his presidency. I take this opportunity to pay tribute to the outgoing President, François Hollande, whose term marked successful international policy and strong relations with the Kurdistan Region. I extend my best wishes to the people of France and President Emmanuel Macron. Barcelona, Catalonia, Spain (dfr.gov.krd)– Minister Falah Mustafa met with Ms. Carme Forcadell Lluis, President of the Catalan Parliament. Minister Mustafa thanked the Catalan parliament for recognizing the crimes against Yazidis, Christians and others as acts of genocide and gave an overview of the current financial, humanitarian and security developments in the Kurdistan Region. The Minister also highlighted KRG’s decision to conduct a referendum on independence. Ms. Lluis emphasized the Catalan Parliament’s support to Kurdistan’s right to self-determination. She expressed her gratitude to the Peshmerga in defeating ISIS and the role played by the KRG in restoring regional stability and hosting a great number of displaced people. The KRG Representative to Spain Mr. Daban Shadalaalso attended the meeting. Erbil, Kurdistan, Iraq (krg.gov.krd) – Kurdistan Region Prime Minister Nechrivan Barzani yesterday received Mar Gewargis Sliwa, Catholicos-Patriarch of the Assyrian Church of the East, and his accompanying delegation of Assyrian bishops from the United States, Canada, Europe, Syria, Iran, and the Kurdistan Region. The meeting focused on the general situation of Christians in the Kurdistan Region and Iraq as a whole, with particular attention on the Assyrian Church of the East and its followers. Mar Gewargis Sliwa summarized the situation of Christians and the activities of the Assyrian Church of the East in cities across the Kurdistan Region and Iraq. Mar Gewargis Sliwa expressed his gratitude for the support of the Kurdistan Regional Government, and the direct assistance of Prime Minister Barzani in particular his cooperation in the construction of a church for the people of the Assyrian Church of the East in Erbil. Mar Gewargis Sliwa and his accompanying delegation expressed their pleasure at the level of peace and stability in the Kurdistan Region. They noted the success of the Peshmerga forces in the fight against terrorism. The vdelegation also commended the Kurdistan Region on its considerable progress and development as noticed by the visiting delegation while consecrating Mar Abris Awshalem as the Bishop for the Assyrian Church of the East in Erbil. He also hoped the situation in the Kurdistan Region and Iraq would improve allowing the return of displaced persons to their homes. Prime Minister Barzani congratulated the inauguration of Bishop Mar Abris and wished him success in his new role. He also reiterated the KRG’s support for all Christian churches. He commended the decision of the Church of the East to relocate their headquarters from the United States to the Kurdistan Region, despite security threats in the region. He also acknowledged the church’s trust in the Kurdistan Region and its government. Despite the KRG’s support for Christian IDPs in the Kurdistan Region, Prime Minister Barzani said he supports their return to their homes. In this regard, he reiterated his desire to help them to rebuild their homes. Erbil, Kurdistan Region, Iraq (cabinet.gov.krd) – Kurdistan Region Prime Minister Nechirvan Barzani received General Tom Beckett, UK special envoy for security affairs, Frank Baker, UK Ambassador to Iraq, and a number of British military officials. In the meeting also attended by Deputy Prime Minister Qubad Talabani and Acting Minister of Peshmerga Affairs Karim Sinjari, the delegation expressed appreciation for the cooperation received in the international coalition team assisting to reform the Ministry. In seeking approval of the KRG Council of Ministers, the reform project will be discussed in an upcoming session. The delegation reiterated the UK will continue its military assistance. General Beckett also expressed his appreciation for the great success the Peshmerga have achieved in the fight against terrorism. He commended the cooperation and coordination between the Peshmerga and Iraqi army in military efforts to liberate Mosul. General Beckett also highlighted the importance of an inclusive political process accompanying cooperation in military operations. Prime Minister Barzani expressed his government’s appreciation for the British Government’s continued assistance to the Kurdistan Region. He also stated his appreciation of the international team assisting to reform the Ministry of Peshmerga Affairs. The team intends to help the KRG in its efforts to build a professional and modern Peshmerga force. Prime Minister Barzani also commended the close coordination between the Peshmerga and the Iraqi army in the battle to liberate Mosul. He also stressed that it is essential for Baghdad to start a comprehensive political process for the post-Mosul liberation so people in the region can return to their homes with confidence. Prime Minister Barzani also reiterated that it is necessary to have frank dialogue in order to reach suitable solutions to the issues between Erbil and Baghdad. 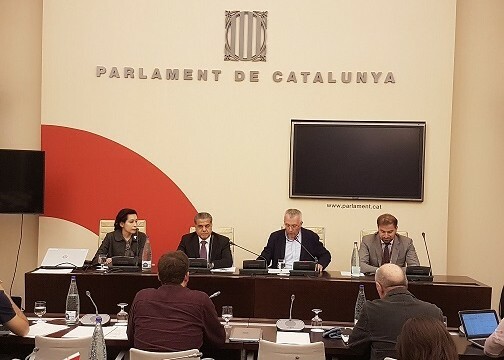 Barcelona, Spain (dfr.gov.krd)- Minister Falah Mustafa delivered a speech to the Parliament Intergroup for the Collective Rights of People of the Parliament of Catalonia to brief them about the history of Kurdistan and the challenges and opportunities facing the Kurdistan Regional Government. Minister Mustafa spoke in detail of the history of the Kurdistan Region outlining the complexity of the situation in the region and the difficulties facing ethnic and religious minorities in the Middle East. The minister also pointed out that since the beginning of Syria crisis, the Kurdistan Region has become a safe haven for members of different ethnic and religious groups fleeing ISIS brutality. The minister called on the parliament of Catalonia to recognize the ISIS crimes committed against Yezidis, Christians and others as acts of genocide. Following the speech, the Minister answered questions from the parliament members, NGO representatives and other participants regarding developments in Kurdistan and the broader region.